The theatre is amazing. It has beautiful sculptures. The show is incredible and the music is great. I and my husband really enjoyed my time here. It is not too noisy and the staff is nice and very friendly. There are a few things I do recommend: (1)Do not hold your cameras too high, because it will disturb and annoy other people while taking a photograph, video (2)Enjoy taking a video, it is OK. (3)You definitely might be surprised by the SPARKS at the end of the show and in some scenes ... SPLASH! (4)NO Flash!!! Now, where was I? You need to get a brochure that has a lists of shows as well as some info about the show in 6 different languages (including ENGLISH). You also need to take a video of the eleventh part of the show (Turtle Legend). The seats are very comfortable. The set equipments are traditional. Always remember to take marvellous photographs like we did. Good day. Originating in the rice paddies of the Red River Delta in North Vietnam, traditional water puppet plays remain one of the most popular draws for travellers in Ho Chi Minh City. 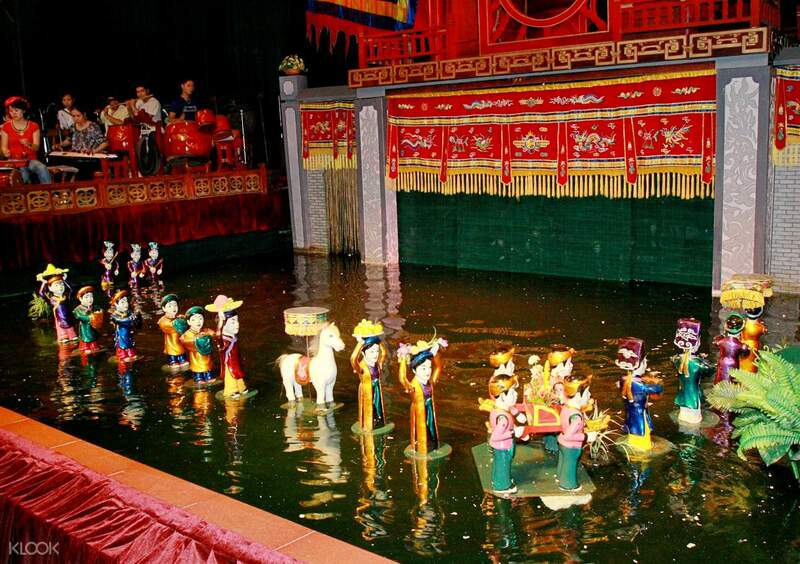 If you want to truly immerse yourself in the local culture of Vietnam’s largest city, then catch a show at the Golden Dragon Water Puppet Theater! Located in Tao Dan Park, the theater offers nightly shows that are often sold out due to limited seating. You can buy your tickets in advance and have them delivered to your hotel or you can pick them up at your convenience. On the day of your selected show, you will be greeted by ushers dressed in áo dài or traditional silk tunic by the theater doors. The shows are performed entirely in Vietnamese but the puppet gestures and accompanying music are captivating even to foreign audiences. 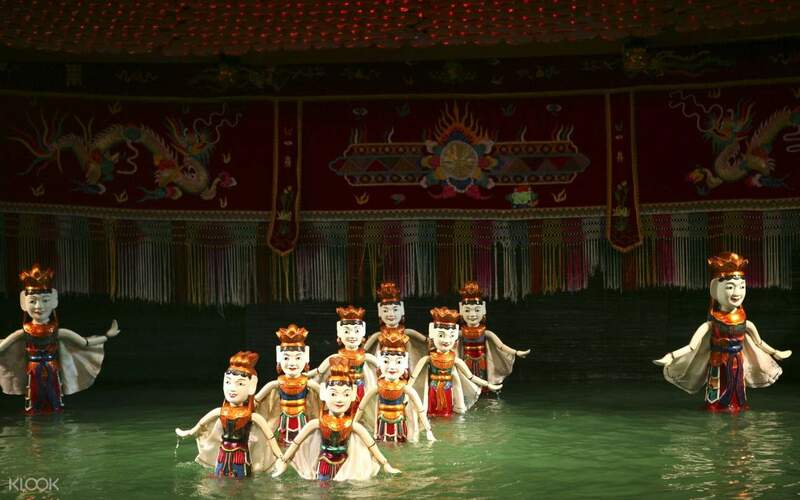 The orchestra is often positioned to one side of the stage adding in sound effects and playing traditional music using drums, wooden bells, horns, bamboo flutes and cymbals as the dragons, fairies and other ornamental figures dance across the water stage. 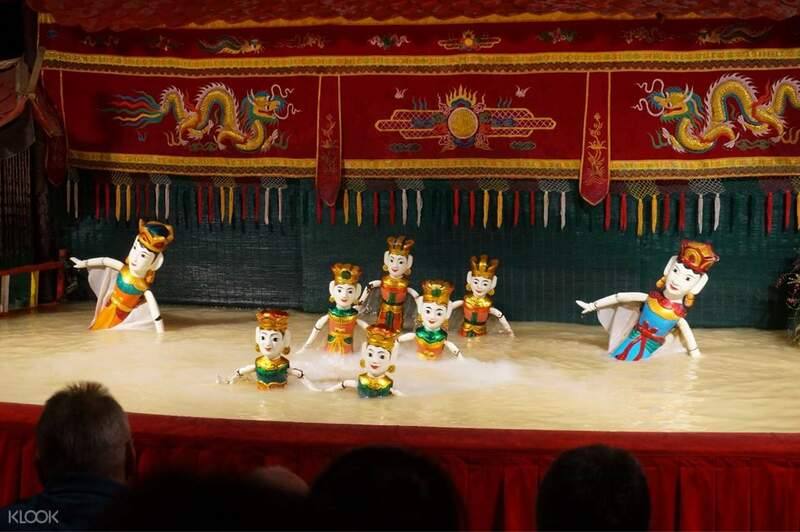 Most of the shows recount Vietnamese folk tales, legends, and significant seasonal events, like the celebration of the rice harvest, depicted in a humorous fashion. The guests were well assisted. The show was unique and authentic. It depicts the Viet culture. I bet it will be greatly enjoyed by children. The music is live and uses traditional musical instruments, and the singing is like classic. Overall, a fun cultural show that I would recommend. The guests were well assisted. The show was unique and authentic. It depicts the Viet culture. I bet it will be greatly enjoyed by children. The music is live and uses traditional musical instruments, and the singing is like classic. Overall, a fun cultural show that I would recommend. Must watch when you go to Vietnam. A unique experience even though there is language barrier you will still understand the story based on the puppet’s movement. The booking receipt was delivered to our hotel and just present it on ticket booth in exchange of physical ticket. Must watch when you go to Vietnam. A unique experience even though there is language barrier you will still understand the story based on the puppet’s movement. The booking receipt was delivered to our hotel and just present it on ticket booth in exchange of physical ticket. Worth the visit. A glimpse of the Vietnamese culture at a lighter perspective! Fun and relaxing. Ok for kids and kids at heart. By the way there is an outlet store beside the theater! Worth the visit. A glimpse of the Vietnamese culture at a lighter perspective! Fun and relaxing. Ok for kids and kids at heart. By the way there is an outlet store beside the theater! worth it! !, yes its kinda boring but if you listen and just appreciate the concept of the story you will definitely enjoy and get hook up to it. worth it! !, yes its kinda boring but if you listen and just appreciate the concept of the story you will definitely enjoy and get hook up to it. I liked the show very much as it was entertaining however the local operator did not deliver the tickets to my hotel by 1-2 days before the show per stated in the Klook voucher’s redemption procedure hence it was a dampener. I had to ask the hotel front desk staff to call them to deliver the tickets to my hotel numerous times. I only got my tickets few hours before the show. I liked the show very much as it was entertaining however the local operator did not deliver the tickets to my hotel by 1-2 days before the show per stated in the Klook voucher’s redemption procedure hence it was a dampener. I had to ask the hotel front desk staff to call them to deliver the tickets to my hotel numerous times. I only got my tickets few hours before the show. The theatre is amazing. It has beautiful sculptures. The show is incredible and the music is great. I and my husband really enjoyed my time here. It is not too noisy and the staff is nice and very friendly. There are a few things I do recommend: (1)Do not hold your cameras too high, because it will disturb and annoy other people while taking a photograph, video (2)Enjoy taking a video, it is OK. (3)You definitely might be surprised by the SPARKS at the end of the show and in some scenes ... SPLASH! (4)NO Flash!!! Now, where was I? You need to get a brochure that has a lists of shows as well as some info about the show in 6 different languages (including ENGLISH). You also need to take a video of the eleventh part of the show (Turtle Legend). The seats are very comfortable. The set equipments are traditional. Always remember to take marvellous photographs like we did. Good day. The theatre is amazing. It has beautiful sculptures. The show is incredible and the music is great. I and my husband really enjoyed my time here. It is not too noisy and the staff is nice and very friendly. There are a few things I do recommend: (1)Do not hold your cameras too high, because it will disturb and annoy other people while taking a photograph, video (2)Enjoy taking a video, it is OK. (3)You definitely might be surprised by the SPARKS at the end of the show and in some scenes ... SPLASH! (4)NO Flash!!! Now, where was I? You need to get a brochure that has a lists of shows as well as some info about the show in 6 different languages (including ENGLISH). You also need to take a video of the eleventh part of the show (Turtle Legend). The seats are very comfortable. The set equipments are traditional. Always remember to take marvellous photographs like we did. Good day. I thoroughly enjoyed this water puppet show! Loved the ingenuity in creating their highly agile puppets and entertaining performance. I sat on the second row and it was nice seeing the puppets up-close. Went with a group of 8, some felt bored due to the lack of translation (the entire show was in Vietnamese) but I personally felt that it wasn’t much of an issue for me. Highly recommended if you enjoy and appreciate traditional culture and heritage. I thoroughly enjoyed this water puppet show! Loved the ingenuity in creating their highly agile puppets and entertaining performance. I sat on the second row and it was nice seeing the puppets up-close. Went with a group of 8, some felt bored due to the lack of translation (the entire show was in Vietnamese) but I personally felt that it wasn’t much of an issue for me. Highly recommended if you enjoy and appreciate traditional culture and heritage. It is just nice to watch at 45 minutes. My boy was really enjoy the show. However our seats are arranged by the staffs. We got front seats to watch the show. One thing to highlight is please come to this place on time as the show will start on time. Don't miss it. It is just nice to watch at 45 minutes. My boy was really enjoy the show. However our seats are arranged by the staffs. We got front seats to watch the show. One thing to highlight is please come to this place on time as the show will start on time. Don't miss it.